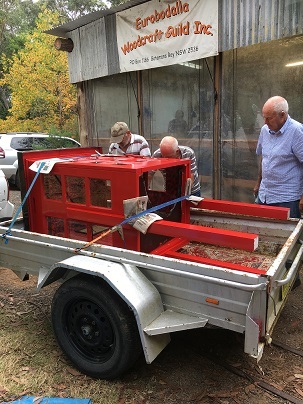 Right from the start, it was envisaged that the Eurobodalla Woodies would have a lively role in community and charity work.That lofty aim was realised from the start, and continues today. Charity begins at home, so they say, and so do we. 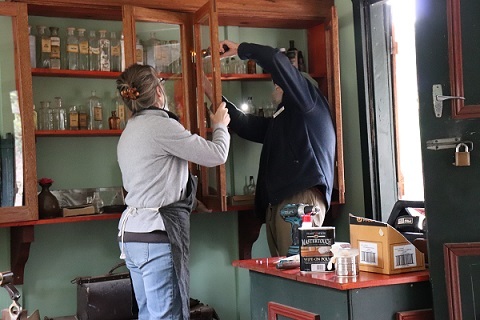 Our home is at the Original Gold Rush Colony at Mogo, and in recognition of their generosity to us, we're happy to support their aims to provide an educational and enjoyable experience for visitors to the area. 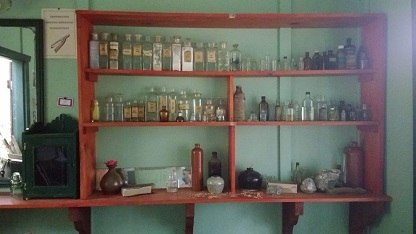 The Colony has many buildings and features that represent life as it was in the Gold Rush days. What is a town without a train station? 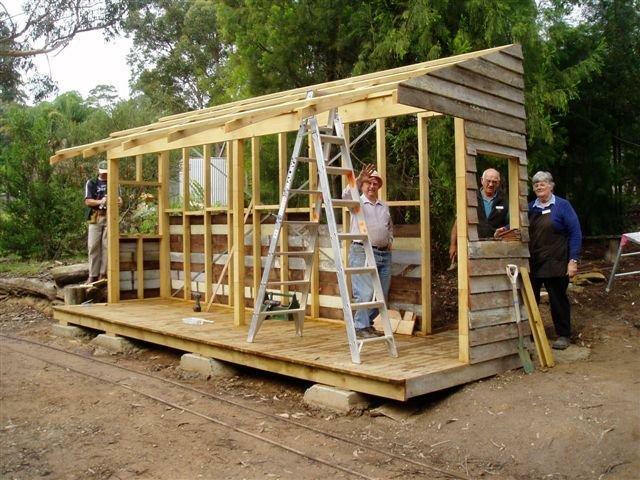 Woodies building the Original Gold Rush Colony Train Station. 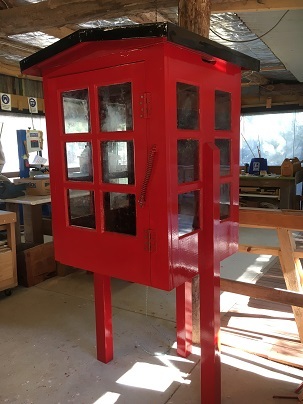 Every year the Anglican and Uniting Churches put together shoe boxes full of small gifts for disadvantaged children overseas. 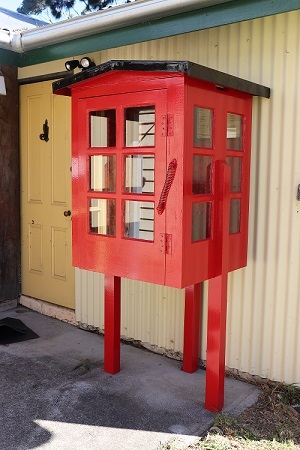 The contents have to be light to keep postage costs as low as possible. 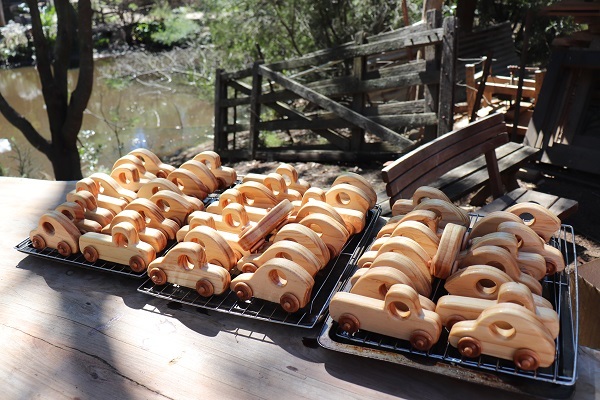 Val and others of the Woodies put together a batch of half size wooden cars to go in these boxes. Below is the latest lot of cars to get their baby oil bath before being dispatched. 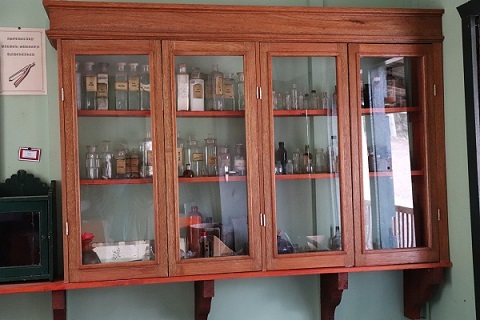 The Apothecary's cabinet in the Barber / Undertaker/ Doctor / Dentist's building needed rejuvenation and rebuild. 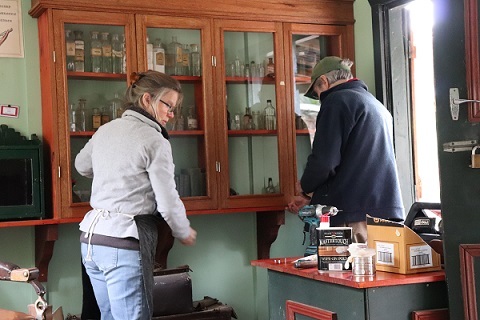 Eric and Ann took this project on and after many weeks of exacting carpentry skills the cabinet was finally reinstated. 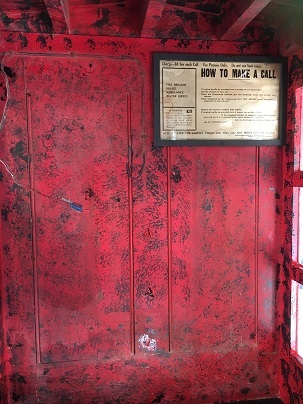 The MDHS had a phone box sadly in need of restoration.It had seen better days and was in bad shape.The Woodies were asked if they could do anything. 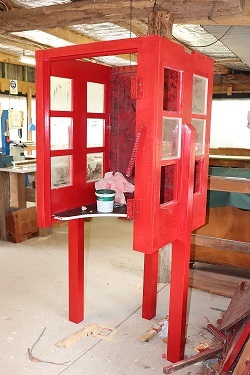 Unfortunately the job became a rebuild not a restoration as much of the box had modern 'repairs'. 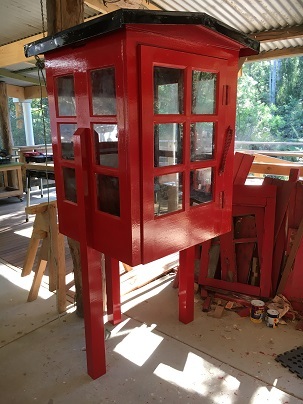 Some parts of the box were usable, such as the metal roof however most of the main carcass had to be replaced. 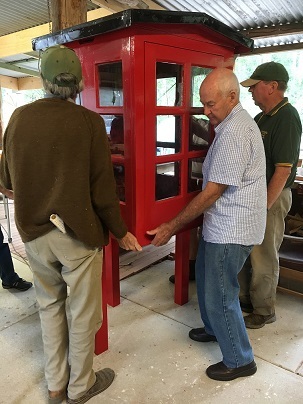 Eric Simes was in charge of the project and was ably assisted by Ann Salmon and Ken McIntyre.Eric's planning skills and attention to detail has resulted in a 1950's replica phone box that will see many years to come. 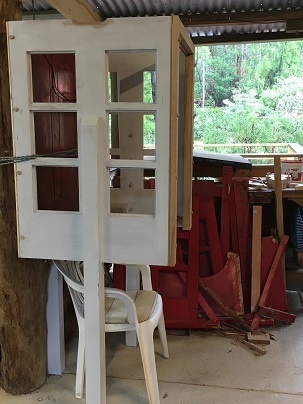 Leaning up against the bench to the right of the box you can see the discarded useless pieces of the box that were unusable. 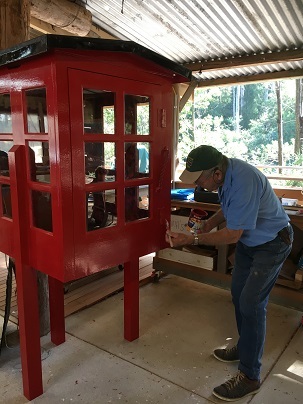 Ken giving the phone box a touch up before it leaves the shed. 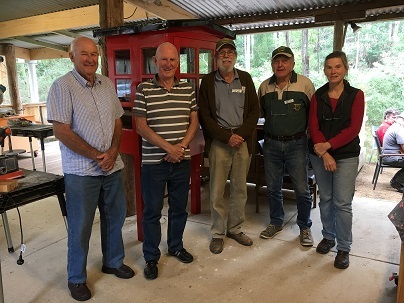 The Woodies construction team handed over the refurbished box to David Montgomery and Huon Hassall of the Moruya Historical Society. 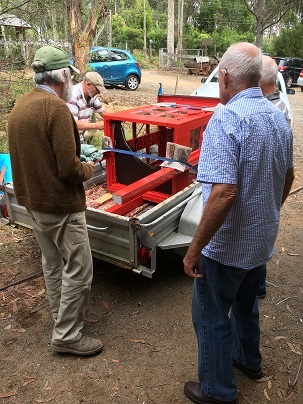 The box was carefully carried and packed into the trailer ready for it's return journey to the Museum. 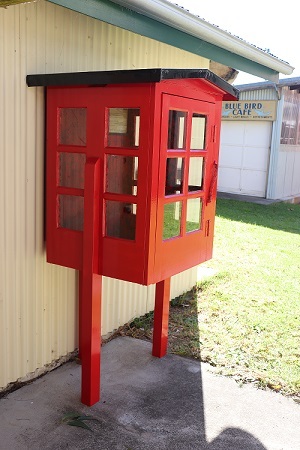 The restored phone box back at the Moruya Historical Museum. 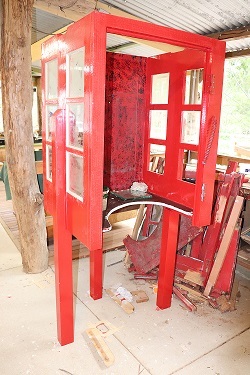 All that's left is to find a suitable handle for the door and install a telephone as close to the originals as possible. 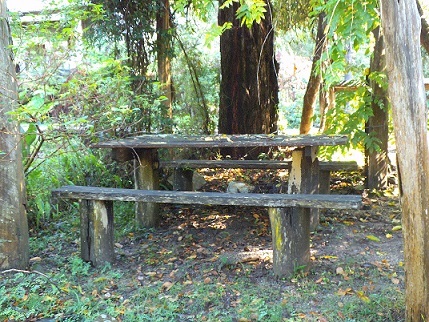 The outdoor eating tables at the Digger's Rest were sadly in need of refurbishment. 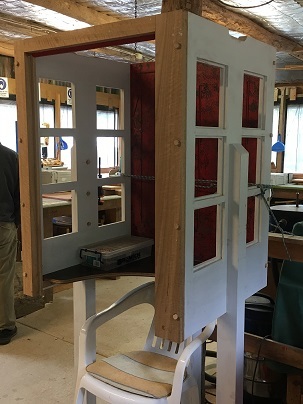 A team of Woodies got together and the result is a testament to their skill and attention to detail. 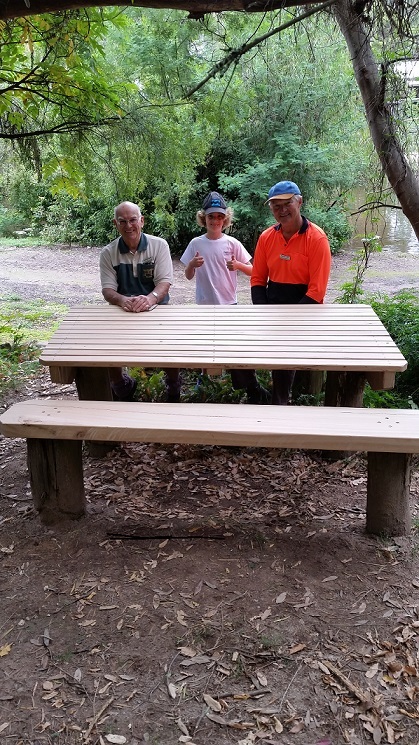 A raised garden bed was constructed for Tyson of Batemans Bay High School. Of course it will be of great benefit to those that come after him in the years to come. Tyson and Bob from the Woodies discussing his plants. Just a little bit of help to plant the latest veggie seedling.